Alloy of 60 percent Tin and 40 percent Lead; no external flux is needed. 361 degrees F ? 375 degrees F melting range. Can be used for electrical applications including wiring and other fine electronic work. Contains lead. Not for use on drinking water lines. Lead free alloy of 95 percent Tin and 5 percent Antimony. Most commonly used where frequent and extreme temperature changes and vibrations occur. Meets the requirements of the Safe Water Drinking Act; 450 degrees F ? 464 degrees F melting range. Alloy of 60 percent Tin and 40 percent Lead; no external flux is needed. 361 degrees F ? 375 degrees F melting range. Can be used for electrical applications including wiring and other fine electronic work. Contains lead. Not for use on drinking water lines. Lead free alloy of 95 percent Tin and 5 percent Antimony. Acid flux is contained within the core. Used for for sheet metal, radiator, gutter repair work with a melting range of 450 degrees F-464 degrees F; .081" gauge 40 percent tin and 60 percent lead alloy with acid flux contained in wire core; no external flux necessary. For sheet metal work, auto radiator repair, steel gutters and more. Not for use in electrical applications. 361 to 460 degrees Fahrenheit melting range. 0.081" diameter. Contains lead, NOT for plumbing applications. 40 percent tin and 60 percent lead alloy with non-corrosive and non-conductive core flux for electrical and electronic soldering such as appliance repair, radio, TV, wiring motors and non-drinking water lines; melting range of 361 to 460 degrees F.
Easy to use; solder and flux all in one. Can be used on drinking water lines. Includes acid brush. Lead free alloy of 95 percent Tin and 5 percent Antimony. Most commonly used where frequent and extreme temperature changes and vibrations occur. Meets the requirements of the Safe Water Drinking Act; 450 degrees F ? 464 degrees F melting range. Fast, easy, permanent; apply inside the copper connector, fit in the copper pipe and within seconds a permanent leakproof seal will occur. Pressure may be applied after two minutes; can withstand pressures up to 500 PSI; can withstand temperatures from -60 degrees F to +300 degrees F. Meets US Military specifications. Good with all refrigerants. Alloy of tin, silver, copper and bismuth. Works with any high grade paste or liquid flux and a standard propane torch. Oatey No.95 tinning flux recommended. Provides excellent flow and fill characteristics with a melting range of 420 to 460 degrees F; 0.117" diameter. Used for tin plate work, sheet metal seaming, and hot water heating lines. Meets requirements of Safe Drinking Water Act for use on copper potable water lines. Lead free alloy of 95 percent Tin and 5 percent Antimony. Acid flux is contained within the core. Used for for sheet metal, radiator, gutter repair work with a melting range of 450 degrees F-464 degrees F; .081" gauge 40 percent tin-60 percent lead, .125" gauge; can not be used on drinking lines. General uses: solder pipes, brazing metal, plumbing and automotive repairs. Product details: wire melting temperature: 450 degree F; diameter: 0.062"; wire net weight: .75 oz. silver solder; .5 oz. water soluble paste flux - NSF certified to ANSI/NSF61. Kit contents: 3 oz. 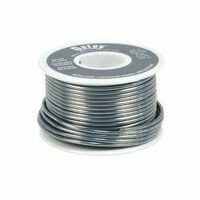 solid wire solder, 1 oz. water soluble paste flux, 2-1/4" acid brush, abrasive cloth. Alloy of tin, silver, copper and bismuth. Meets requirements of Safe Drinking Water Act for use on copper potable water lines. Provides excellent flow and fill characteristics. 420 to 460 degrees Fahrenheit melting range. Includes 8 oz. solid wire solder 0.117" diameter, 1.7 ozs. No.95 lead free tinning flux, acid brush, sand cloth, and how-to instructions. Alloy of 40 percent Tin and 60 percent Lead. For repairing galvanized gutters, filling metal seams and other general repairs with a melting range of 360 degrees F - 460 degrees F. Can not be used on drinking water lines; .081" gauge. Alloy of 50 percent tin and 50 percent lead, use with Oatey #5 paste or liquid flux. Used for sheet metal, galvanized gutters, general repairs and non drinking water lines. Not to be used for plumbing. .125" gauge. Contains lead, NOT for plumbing applications. 50 percent tin and 50 percent lead; use of flux required; .125" gauge. General purpose solder for sheet metal work, auto radiator repair and steel gutters. Contains lead, NOT for plumbing applications. IAPMO Listed solder and water soluble flux NSF-61. Flux meets ASTM B-813 standard and is City of L.A. approved. Lead free silver solder meets ASTM B-32 standard. Kit contains: 8 oz., .117" gauge silver lead free solder, 1.7 Oz. H-20-5 water soluble flux, an applicator brush and a sand cloth. Fast, easy, permanent; apply inside the copper connector, fit in the copper pipe and within seconds a permanent leakproof seal will occur. Pressure may be applied after two minutes; can withstand pressures up to 500 PSI; can withstand temperatures from -60 degrees F to +300 degrees F. Meets US Military specifications. Good with all refrigerants. Alloy of Tin, Copper, Silver, and Bismuth that works much like 50/50 solder. Recommended for use on potable water systems for sweating copper joints. Also effective on stainless steel, brass alloys, chrome alloys, galvanized steel and cast iron piping. Works with any high grade paste or liquid flux and a standard propane torch. Oatey No.95 tinning flux recommended. Provides excellent flow and fill characteristics. 420 to 460 degrees F melting range; 0.117" diameter. Meets ASTM standard B-32 and the requirements of Safe Drinking Water Act. Can Not Be Used On Aluminum. Alloy of 50 percent tin and 50 percent lead, use with Oatey #5 paste or liquid flux. Used for sheet metal, galvanized gutters, general repairs and non drinking water lines. Not to be used for plumbing. .125" gauge. Contains lead, NOT for plumbing applications. For electrical applications including wiring and other fine electronic work. Contains lead, not for use on drinking water lines. Flux residue is non-corrosive and non-conductive. 60/40 alloy of 60% tin and 40% lead. Premium high strength acid flux cored silver bearing solder for joining all metals except aluminum, magnesium and zinc die cast. 6% silver content. Stays birght and hard. Nontoxic. Joint strength up to 20,000 PSI tensile strength. Weight: 9 oz. Working temperature: 431? F (221.7? C). Application temperature: 400? F to 700? F (204? C to 371? C). 40 percent tin and 60 percent lead alloy with non-corrosive and non-conductive core flux for electrical and electronic soldering such as appliance repair, radio, TV, wiring motors and non-drinking water lines; melting range of 361 to 460 degrees F.